Two years ago I attended the Kentucky Derby with my dear friend Holly. It was quite an experience .. hats, horses, drunks, mint juleps. When I moved to Baltimore a few months ago, I remembered that the Pimlico Race Course was the site of the second jewel in the Triple Crown – it’s here they run the Preakness Stakes. “Let’s go!” I said to my mom. “Let it rain,” is what Mother Nature said in the days leading up to Preakness weekend. We planned to attend Black Eyed Susan Day, the Friday prior to the Preakness, meant to be a ladies day out. And let’s be real, the tickets are half the price. We purchased two seats in the Upper Grandstand, and I had the opportunity to scope out the course while volunteering at a wine festival in early Spring. Turns out the rain DID go away (it was probably our singing and dancing) and by 12 noon we were pulling into a very muddy parking lot to go to the races. Early reports of attendance say that 37,000 people were at the track on BES Day, compared to the 120,000 that would roll in for Preakness the following day to see California Chrome take the second jewel in the Triple Crown. The first bet we placed was a winner, a horse named Exchange Student ridden by a female jockey. Obviously, I was meant to win. She placed second and won me $13.20! No further wins followed but we had ourselves a lovely, if muddy, day. God I missed pizza. On the long list of things I had made in my mind about my return to the East Coast, it should come as no surprise that many food items were included. Pizza is high among these, after a spoiled childhood of glorious pies from local shops or jaunts into the city. And now? Enter Baltimore. Gourmet. Artisan. Fancy. Call it what you want, but posh pizzas are no joke in Baltimore County. I am finding my way through the intense foodie scene in town and also picking up a few favorites… ok, a LOT of favorites. Here are some of my recent experiences from super fancy (and accordingly priced) to consistent and affordable standards. Had it at a housewarming party and was able to enjoy samples of at least two different kinds. Menu boasts local produce (“Locavore”) divine cheeses and sassy sauces (fresh mozzarella, fontina, bechamel) and a host of other delights. My personal fave: Duck, Duck, Goose: Duck Confit, Fig & Onion Jam, Balsamic Fontina & Asiago, Duck Egg. Tremendous! Also tried: Spicy sausage & fennel. Side notes: Intense appetizer list and huge craft beer selection for in-house dining. Gluten free pies available. Prices range from $14 margherita to $17 posh pizza. Favored by colleagues and featured in Baltimore Restaurant Week this was on my to-do list. It’s settled into a sweet neighborhood corner and is very cozy both in and out. I tried it this past Sunday for BRW and it was a steal for $30 (entree sized salad, medium pizza, dessert). 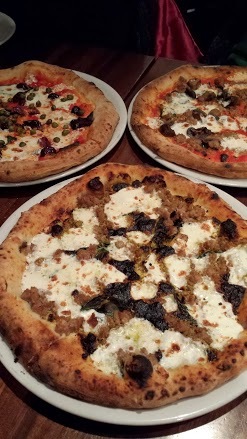 I tried: Pistachio e Salsiccia, a BRW white pizza. Pistachio pesto, sausage, fresh basil and EVOO. Epic. Dying to try: Brunch. Pizza. 2 favorite words! Side notes: Great bar and specialty cocktails – I tried one with ginger beer that was perfectly refreshing while sitting in front of the brick oven. A gluten free friend notes that this is the thickest gluten free crust she’s ever had. Portion sizes are incredible. (For the record, I do like Chicago deep-dish). Facts: Vito’s has my kind of pizza. You can buy a slice of whatever your heart desires, and it’s larger than my face and / or a paper plate. The owner speaks Italian and his workers speak Spanish (we had Barça football to discuss the first time I was there). The crust can stand up to just about anything, including New York scrutiny (I tested it on a few friends). Side notes: The garlic knots will keep people away from you for 2 days. Hot & cold subs, pasta, calzones, stromboli .. all the real deal. Prices are delightful, maybe $3-6 a slice depending on toppings. Although my mailbox had been peppered with advertisements for local pizza, including a strange mix of Indian + pizza in one place (?) – I found Mario’s via GrubHub. I’d never used it before coming to Baltimore and now I think it’s the best thing since .. well, pizza. You can order on your phone, read menus and reviews, access coupons and track your order. I ordered: White pizza with broccoli. Apparently the GrubHub menu did not specify broccoli OR spinach as the restaurant intended, so a manager called and asked me what my preference was, which I thought was lovely. Side notes: Some restaurants do have a delivery minimum, so you might get conned into buying more than you want (see, my earlier order from the sub par Chinese restaurant). Prices are perfect with $8.99 for a medium cheese pie and up to $15.99 for specialty pies like the large Veggie Lover. Thanks for satisfying my pizza craving, Baltimore! This past Saturday I wandered over to Belvedere Square. I’d received a mailer around Small Business Saturday in November and am just now getting around to exploring. Can I just say that I’ve been missing out? Belvedere Square is a sweet little conglomerate of stores, shops, restaurants and great people. When I first checked out their website it’s no surprise I was gunning for the food. What I didn’t expect was the wide variety of businesses peppered throughout the block. You’ve got a salon, a diner, a bagel joint, a bank (two? ), a pizza parlor, a pub, a gym .. what is this, New Jersey? The real draw for me was the indoor market, which I can only imagine must be stunning in good weather with it’s cute cafe tables and booming business. I knew the key players from the website, and had chatted with @AtwatersBakery who informed me that croissants were happening for the first time this weekend. Check! Atwater’s also sports a deli counter where you can get your lunch fix, and do some quality people watching. Atwater’s is in good company with Planet Produce / Earth’s Essence – purveyor of fresh fruit & veg and fresh juices and smoothies. I almost passed out when I saw a Zumex machine tucked into the corner of the produce section .. these things are The Answer to real orange juice in Spain, and I’d never seen one in the U.S. This alone will encourage me to go back again and again and again. I also dipped into Grand Cru for a bottle of red wine, stopped at Neopol Savory Smokery for a pound of andouille sausage and some Italian pasta from Ceriello Fine Foods. Let’s not forget the muffaletta sandwich for lunch, the apple/carrot/ginger juice and a $9 matinee at the nearby Senator Theatre which dates back to 1939. So much more to sample when I return. Shoofly Diner – just named one of the “Best New Bars in the South” by Southern Living. Yeah, I don’t believe this is the South either .. Mason Dixon line be damned. There’s also Sofi’s Crepes which recently catered an event for our office (duh, crepes are international). Greg’s Bagels was high on my list but I had zero cash at the time and the line was a mile long. Ryan’s Daughter is where I parked my car (4 hour limit for B Square shoppers) but I do have plans to return for a pint. All that said, I am quite ok with this to-do list! Good day? Great day. Thanks, Belvedere Square .. see you soon.